This book is so bittersweet. I’m really happy and so sad at the same time…because I’m no longer in Hogwarts. I’m no longer taking a magical journey with Harry and Hermione and Ron. But I DID IT. After 18 whole years on this planet, I FINISHED HARRY POTTER. Anyway, enough about that – I have a post scheduled for Tuesday all about my overall HP journey – let’s talk about the last book. The thing I really noticed in this book is how complicated and complex the storyline is. Hallows, Horcruxes, Hogwarts, fighting. 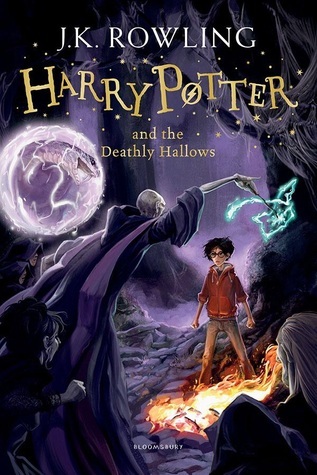 Along with all of the personal parts of the plot (their romances, friendships and families), I felt Harry mature with the story and I loved reading about his thoughts. I have to say even though I loved this book, it could be a little too complicated for my liking. In fact, I had to read the last couple of chapters in my room, on my own, in complete silence, to be able to fully understand everything that was going on. The only thing I have to mention I didn’t like in this book was it was very hard to adapt to not being in Hogwarts. As awesome as it was travelling the British countryside, I did want so badly to be back in the castle.